Oliver Jack Wells - born Thursday 20th October at 6.28pm, weighing 6 pounds. 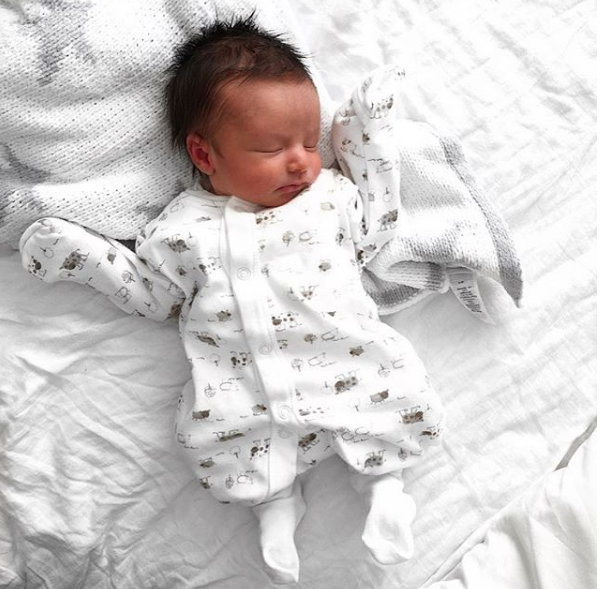 Here's the birth story - grab a cup of tea and make yourself comfy because it's a long one! I finished work at 37 weeks and decided to spend my days going for long walks, and trying every old wives tale under the sun to get things moving. I'd spent the Tuesday and Wednesday out walking and had some lower back pain and the occasional pain that felt a bit like trapped wind in my back. I'd accepted that I'd probably go overdue though so I wasn't getting my hopes up too much. On Wednesday 19th October, I was at home with Andy watching telly and bouncing on my birthing ball as per usual. I was shattered but since I'd been feeling so awful the last few days and was looking exhausted, I went for a long bath, put on some fake bake, painted my nails and washed my hair. When I went to bed, I had the full on fake-tan face and jokingly tweeted that I'd be in trouble if I went into labour during the night. If that wasn't tempting fate then I don't know what is! I woke up at 1.30am, got up to go to the toilet and stood staring in disbelief as I watched my waters break onto the bathroom floor. TMI alert - there was a lot of water. Enough that I had time to shout on Andy, who then came through and joined in on the staring. We both had this look of horror/excitement on our faces. It was still a week until my due date! I phoned the hospital who said we had to come up to get checked, so I had a quick shower (to get rid of all the tan) and we headed in. I was shaking - not sure whether it was fear, excitement or both. The hospital confirmed my waters had gone but that I definitely wasn't in labour. No dilation, no contractions .. nothing. I was to go home and wait to see if anything would happen and if not, they'd schedule me for an induction the following day. Luckily, on the way home I could already feel things happening. Again, it felt like trapped wind in my back and would come and go every now and then. There was no chance I was going back to sleep, so I lay awake until 6am when I just gave in, got up and cleaned the house from top to bottom. Nothing like a bit of last minute nesting! By 8am, the contractions were coming thick and fast. I had planned to spend as much time at home as possible, but was also scared about waiting too long so we decided it was time to go to the hospital about 10am. At this point, I couldn't talk through contractions and they were every 2/3 minutes and last about 1 minute to 1 minute 30. I was already crying through a few of them by this point! When we arrived, I was praying that they'd tell me I was at least 5cm. When they told me I was 2cm, I was terrified. If this was 2cm, then what on earth is 10cm going to be like?! She also told me that my baby was lying 'back to back'. I'd read about that, and knew it was the most painful way to deliver, but the midwife played it down and said it's common and the baby usually turns before he comes out. I still don't know if he did it or not. That midwife had given me some gas and air to calm me down before she checked me and when I asked if I could hang on to it, she said 'wait until your further along before you use pain relief, you'll understand why later..'. Those words hung in the air for a while after she left and made me feel ten times more scared for what was to come. Luckily, they let me stay in and sent me to the labour ward to wait it out. I was offered paracetamol and a bath, but neither helped and an hour and a half later, I caved and asked for the epidural. My plan was to try and go without the epidural mainly because I'm terrified of getting a catheter, which seems daft in the grand scheme of things I know. The midwife offered to check my progress first, and I nearly cried with happiness when she told me I was 8cm. She was shocked too, and said how amazing it was that I'd got to that point without any pain relief..I'd only been there an hour and a half! If I'd gone from 2cm to 8cm zo quickly then I could be pushing soon, I thought, so I didn't want the epidural. I had a whole new sense of energy as they took me up to the delivery room. I had to get to 10cm and I had gas and air which helped a little at this point. The contractions were getting so strong and about two hours later, I remember the feeling changed. At the end of every contraction, I was pushing. It wasn't by choice, it felt like my body was doing this on it's own and I was really worried that I was doing myself damage by pushing too early but at the same time, I literally couldn't stop it. The midwife who was with us offered to check me again and this was the moment when everything changed. It started with her telling me she'd check see if we could safely start pushing, and ended with her telling me that a mistake had been made earlier and I was actually only 6cm at this point. My heart broke and I felt so helpless. I was back to square one. Not only was it unsafe for me to push, but I had a good few hours of these awful contractions ahead of me. At this point, I wanted all the pain medication. I was physically and mentally exhausted and knew I couldn't possibly go through hours and hours of this. What I didn't realise, was how long an epidural would take. Even when the anesthetist showed up, he took ages to get started. Slowly and calmly telling me all the ins and outs of the procedure, while I was crying in pain and begging him to get started. I was lying on the bed shouting in agony - yes, I was that person from One Born Every Minute who you can hear outside the ward. It was the involuntary pushing at the end of each contraction that hurt the most and I felt like I just wanted to run away from the pain. The epidural process was horrendous. It took so long, and since I was perched on the side of the bed hunched over a pillow, the contraction pain was much stronger than before. The only thing that kept me going was thinking how each contraction could be the last one I could feel. The anesthetist said it could be around 15 minutes before the numbness kicks in, but half an hour later my contractions were stronger than ever and I could feel everything. The doctors checked me from head to toe and around an hour later, they confirmed that the epidural had failed. All that, and no pain relief. I'd actually added more pain to the process, and still had to endure the contractions but with a huge needle in my back. I didn't realise an epidural could fail. The doctor said 'it happens sometimes' and offered to try again but there was no way I was going through that process again. I didn't even have the energy to talk. I was just lying there terrified for the next contraction and staring at the clock trying to set myself a goal to make it too. My body was still pushing with every contraction - no matter how much the midwife told me to breathe out and relax, I couldn't control it. She checked me around 5.45pm and told me that I'd finally reached 10cm and could start properly pushing now. I'd always imagined getting to this point and feeling so relieved, but in reality I was so exhausted and delirious by this point that I didn't really acknowledge it .. I'd been 'pushing' for hours anyway! The next 40 minutes were a blur. I had always tried to imagine what giving birth would actually feel like, but it was nothing like I'd imagined. It was just the oddest feeling and I'd never be able to explain it. When his head was out, I could actually feel him moving. And the feeling when the final push got him out was the biggest relief ever. And there he was. This tiny little baby with a head of thick, dark hair staring up at us. He had a really short umbillical cord, so I had to deliver the placenta before I could hold him but that only took a few minutes. I'm actually welling up when I'm writing this, thinking about the first time I held him. It was the best feeling ever and I can safely say it still hasn't stopped. I've spent hours and hours just staring at his face, wondering how on earth we made him. Despite my huge bump, he weighed a tiny 6 pounds. He has been an absolute angel since that day and although it's a total cliche, no matter how awful the labour (and the pregnancy) was, I would do it ten times over for him. Welcome to the world Oliver! 2 comments on "My Birth Story "
He's beautiful, Eilidh. And what a trouper you are!